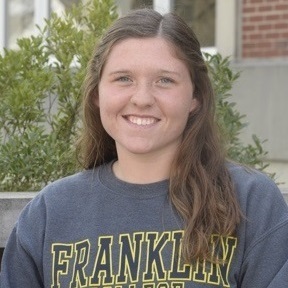 Melissa is a junior at Franklin College, working towards degrees in Applied Mathematics and Quantitative Analysis. She has an impressive list of academic achievements, maintains a 3.98 GPA, and has been the recipient of numerous academic honors, including being awarded the Laurels Trophy her freshman year for being the highest achieving student in the class. Melissa also exemplifies the qualities of a great leader, inspiring and building confidence in those around her, elevating their knowledge and skills. For example, to create a true cohort mentality in the classroom, her Calculus III professor set out the expectation that every student play an active role in other students’ success. The goal was to create an environment where all students learn and grow together. Melissa really embraced this approach, practicing concepts ahead of time to ensure she was able to help explain them to her classmates. She also volunteered to demonstrate the concepts in the classroom, and organized regular study sessions for the entire class. As a result, the overall grades in her class were the highest her professor had seen in nearly four decades as a professor. And, of course, Melissa was at the top of the class. Melissa’s list of achievements extends even beyond her required classwork. In her freshman year, she served as a supplemental instructor for Calculus 1, and is currently a proctor at the Math Study Center, assisting students in classes ranging from Liberal Arts math to Calculus 3. Melissa also dedicates a significant amount of time as a New Student Mentor, a position awarded to only a select few students on campus.